Now that Spring is in full swing here, days are getting longer and brighter. As sun breaks the cover and shines, you realise how badly the place needs a clean, you never saw the dust that settled during the dark and gloomy winter. Like it or not, definitely a time for a spring clean. Freshness of spring takes you to the cleaning mood and for a dose of spring beauty and new life. Spring has led us into Easter, a colourful spring festival of new life. Easter is almost like a mini Christmas but with less stress and is a fuss free festival. Shops and markets not overcrowded, but certainly fancy and attractive chocolate and fruity and spicy Hot cross buns supply starts to dwindle in the supermarket aisles! It's a great opportunity to enjoy and relax with friends and family to savour it all. Colouring the easter eggs and Easter egg hunt are organised in many households for their children. 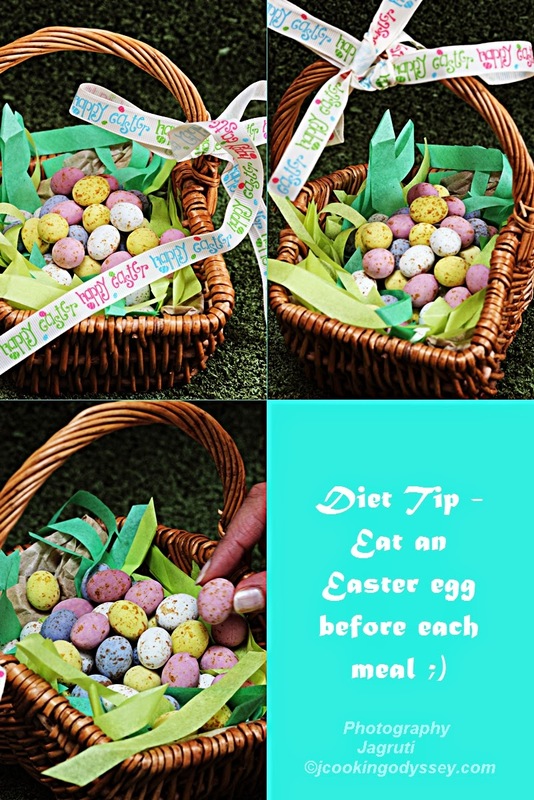 Chocolate easter eggs are given as gifts and on easter sunday friends and families get together and indulge in delicious lunch then parents can unleash their offspring...! Well, my two offspring being at home for the easter holiday, I wanted to do something culinary in the spirit of the Easter holiday. When both kids are at home, for us everyday is feels like a festival, almost every day something special keeps coming on the dinner table, not necessary that those dishes are rich or lengthy processes one, just something little different to keep their taste buds ticking . 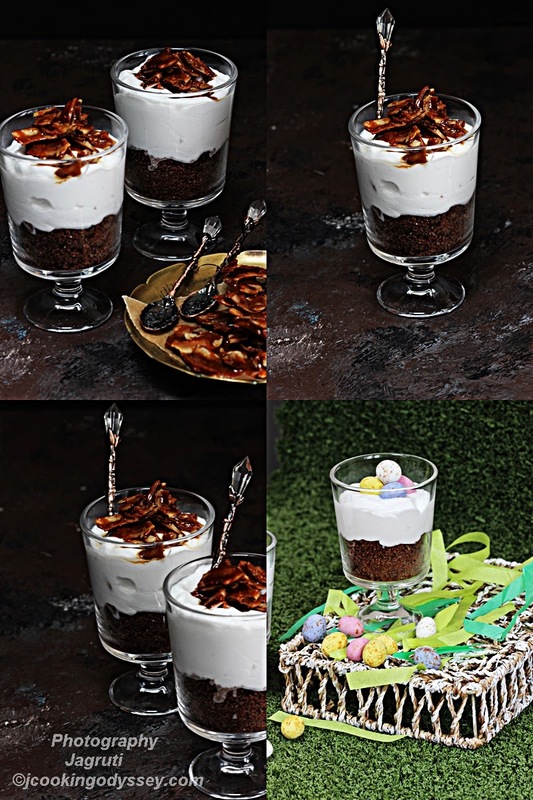 Recipe of Whole Wheat Coconut Raw Chocolate shortbread, Coconut Mousse and Coconut Praline dessert spoke to me, and of course that was my goal to attempt during this easter holiday. 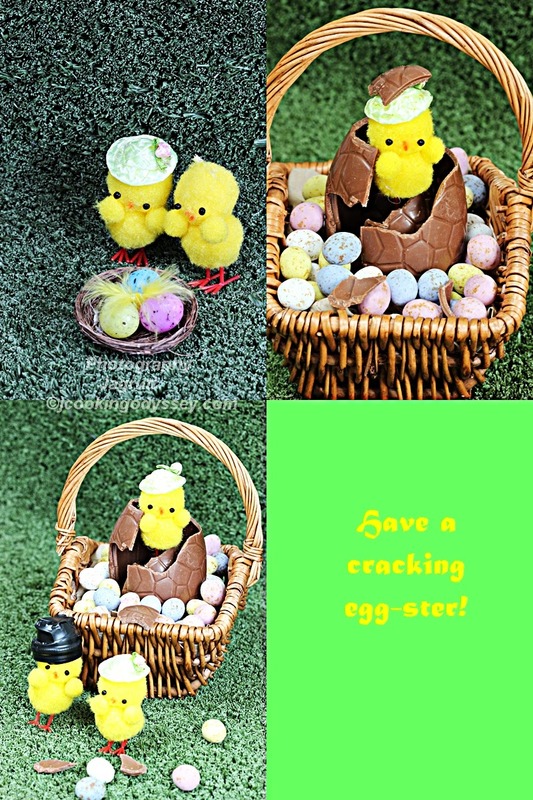 Coconut and Chocolate goes hand in hand with easter and I knew I could dress them up by adding cute mini candy eggs and coconut Praline on the top. Divine and mildly sweet dessert in a glass, heavenly and drool worthy dessert is perfect after heavy meals and guaranteed to impress and it's stress free to prepare as well. Prepare few things in advance and assemble when ready to indulge. Don't you just want a spoon of that goodness ?! It seems that I have created this recipe Vegan, however I have not used Vegan sugar. The reason behind using coconut oil in this recipe is that it accompanies raw cacao powder better. Mixing dairy (I would have used butter in the pastry) and raw cacao reduces the beneficial effects that raw cacao can provide us. Using coconut oil is not only a healthier option but doesn't interfere with raw cacao absorption. Whole Wheat Coconut Raw Chocolate shortbread, Coconut Mousse and Coconut Praline dessert perfect as a stylish finish to an Eater meal. Keep coconut milk can in the refrigerator for 24 hours or more. To make coconut praline slowly caramelize sugar in a pan on a low heat, meanwhile toast the coconut shavings in the oven till light golden. Mix the caramel and coconut together and pour onto parchment paper and let it cool completely and allow to set.In a bowl whisk together flour, sugar, salt and cacao powder.Add coconut oil and rub the flour mix and oil with your fingers and til you get crumbly mixture.Add one tablespoon of chilled water and try to form a dough, if needed add one tbsp water.Once dough is formed let it set for 15 minutes at room temperature not in the fridge.Pre heat oven to gas mark 4.Roll out the dough in a circle on a lightly floured surface about 1/8 inch thickness.Cut out into any shape or leave it as it is, because you are making crumbs out of it. Bake them for 12-15 minutes.Transfer them on to rack and let it cool completely.To assemble the dessert make crumbs by crushing baked biscuits with hands.Place 4-5 tbsp. of crumbs in a serving bowl or glass.Take out the coconut milk can out of the fridge and separate carefully solid coconut cream with the spoon into mixing bowl.Beat the coconut cream in a electric mixer until it gets thicker and holds it's shape. Spoon it onto crumbly mixture glasses. 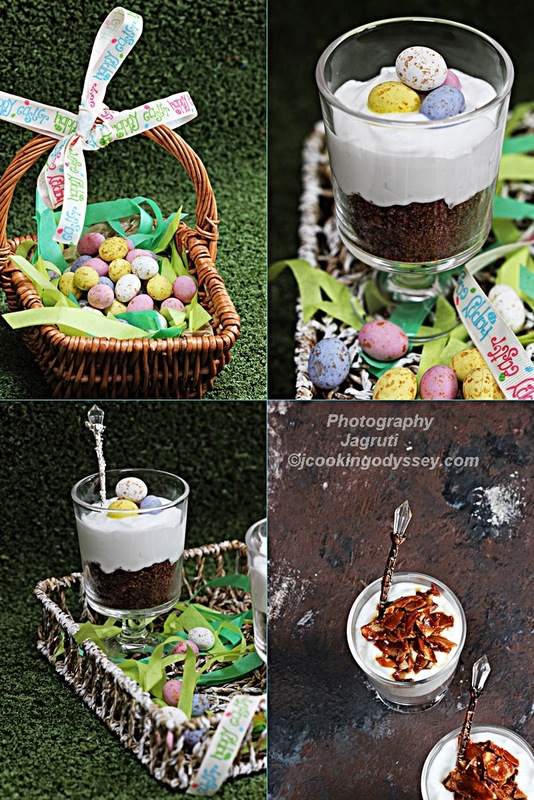 Break the praline and scatter over the biscuit and coconut mixture or top with a few mini candy eggs.Serve immediately. Enjoy !